Balancing her baby on her knees, a mother gazes enraptured at her child. He returns her loving look, chuckling with a sense of love and well-being. 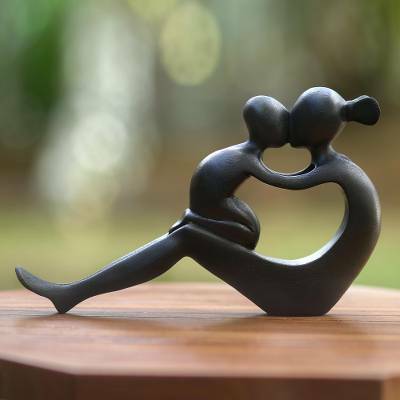 From Eka, this sculpture explores one of life's strongest bonds, celebrating the joy each finds in the other. I purchased the mother and child wood sculpture for my daughter, who had her first child this year. She and I both absolutely loved it, especially because of the story of the artist. This is a gift that she will keep forever! Beautifully crafted wood sculpture , it feels and looks wonderful in my collection and represents the beauty of being a mother. This sculpture looks great on my shelf. I love the way it convey's the mother's love. I bought this for a friend who's having her second baby this year. I wanted something other than the usual baby blankets, clothes, etc., and this fits the bill beautifully. Very well crafted and finished! It is a very nice piece. My wife really loved it. I even got a hug and smile.